Well, I'm a little late (again) for Garden Bloggers Bloom Day so again on this June day I'll be posting a GBBD post on Bloomsday. I don't do it on purpose but I'm also okay with giving a tip o' the hat to Molly and Leopold. 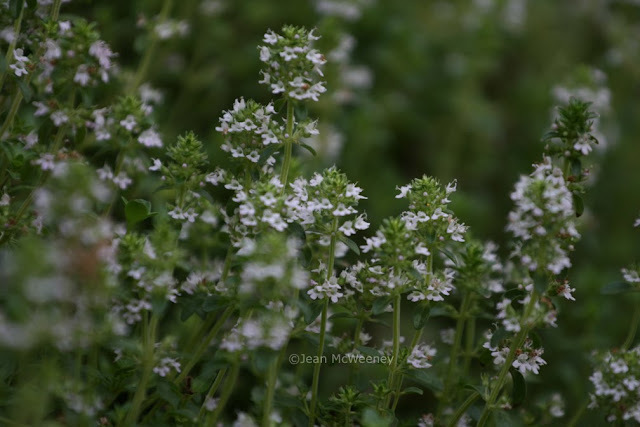 A little bit about my thyme plant above, now in bloom (there's that Bloom again!). Several years ago I planted three 4" plants of the 'Mother of Thyme' variety in a corner of one of my 8' x 8' beds. In no time at all they took off and at times have filled a full quarter of that bed. I've been digging up and giving away parts of this plant for a couple of years now. My point? If you have trouble growing thyme, you should have no trouble at all with this one. Good drainage and sun is all it needs. 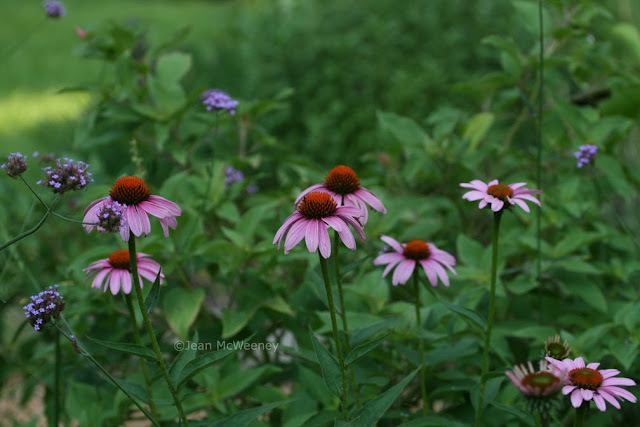 I have three different varieties of purple coneflower (Echinacea purpurea) in my beds but I can't remember which ones I planted where. So I have to wait until they all bloom before I can figure it out (hopefully). Seems like this year they all took a long time to start blooming. 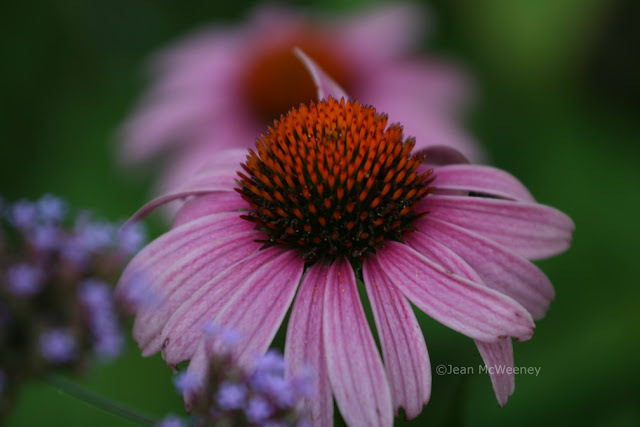 I find the close up photos of coneflowers so interesting. Sometimes I find neat looking bugs hanging out on them, besides the usual bumblebees and butterflies. I can't say enough good things about this particular verbena. It's practically a non-stop bloomer and grower, as you can see by its attempt to take over the irises. Some of the nicotiana, which seeded itself into the gravel paths, has decided to hang out with the rosemary, which has decided to start blocking the gravel paths! These are daylilies that are not what the package named and described. 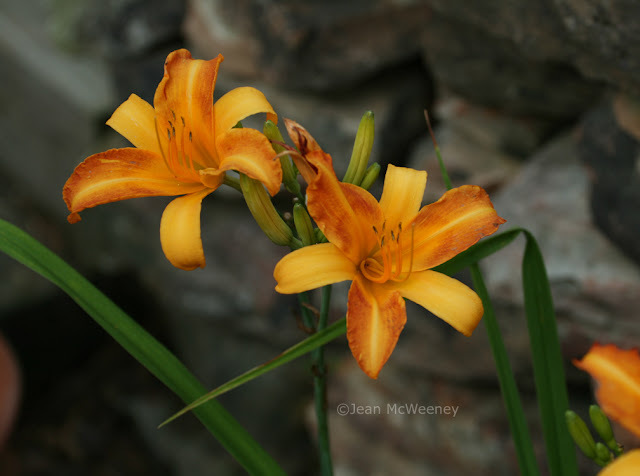 When it comes to daylilies, I learned my lesson about buying them when not in bloom. If any of you daylily geeks know what this one is called, I'd appreciate knowing. Since it's June, I naturally have a few more things blooming than just these plants. But I've had little time to take photos or blog. Still blooming for me are other daylilies plus Marie Pavie rose, pelargoniums, 'Patrick's' abutilon, dianthus, peppers and eggplant, agastache, butterfly bush, crapemyrtles and some salvias. Not blooming for me are the tomatoes - it's too dang HOT. About to bloom for me is the 'Goldsturm' rudbeckia, yippeee! 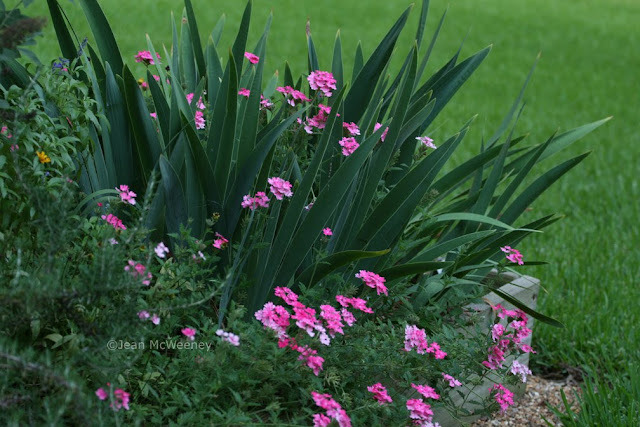 Be sure to check out Carol's blog, May Dreams Gardens, for a complete list and links to everyone who's posting about what's blooming in their yard! Daylilies are funny creatures. If that was bought at a box store, it's possible it was tissue cultured, and daylilies don't like that. They often don't show true to form. On the verbena, I have two of the Lanai series, one peach and one purple. I've loved them both. Your pink is oh-so-pretty. Jean, I enjoyed seeing all your blooms, but what I especially like are the combinations. Coneflowers and verbena bonariensis--perfect! And I'm sure you must have planned that planting of verbena to contrast so well with the vertical iris leaves. You're killing me, Jean - "Good drainage and sun is all it needs." Guess it would go in a large container here! 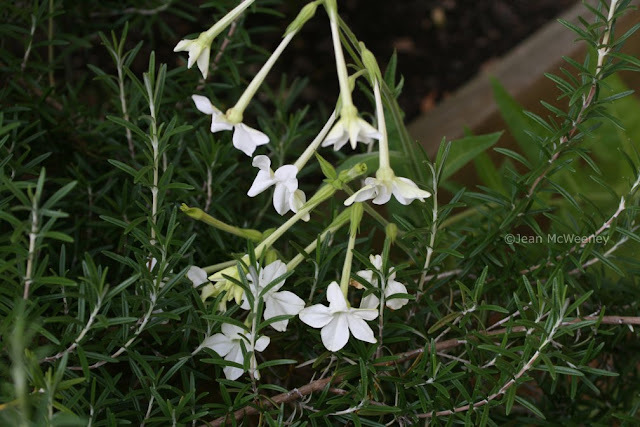 The thyme & rosemary & white nicotiana must make your garden smell wonderful - hope you have a few spare hours to enjoy it. PS Have you ever read Ulysses? The whole Bloomsday thing fascinates me but actually reading Joyce is still on the to-do-someday list. PPS the word verification is "muffet" and for some reason that's making me laugh. Your blooms are lovely! :) And I like your plant combinations, too. The daylilies are just starting here. Stella and Pat Fay are blooming with fat buds on others. Must go out and spray them or the deer will feast. Happy belated bloom day and love that first shot. I have the Purple Verbena but it isn't near as lush as yours. I'll have to tell it to get to growing - lol. Echinaceas are one of the most photogenic flowers in my garden. I had no idea how fragrant they were until I started leaning in for closeups! I just love thyme! And love the nicotiana paired with rosemary. Nice! Your no-name daylily looks very similar to my no-name daylily that I bought from one of those terrible bag of dry roots from the big box store. Mine might have slightly higher contrast between the more yellow petals to the yellow/orange. But that's no help to you since I also don't know the name!